Choosing which AP classes to take can be a pretty stressful decision. The last thing you need to be worried about is trying to understand all of the changes to the redesigned AP Art History course. Let us worry about that for you. Here is everything you need to know for the newly structured AP Art History course. When: Fall 2015 for the course, Spring 2016 for the test. Why: The changes were put in place so that the course would more accurately represent a college level class. The good folks over at CollegeBoard restructured the course to reflect recent changes in the field of art history. Each of these things should overall simplify the challenge of teaching this course. Beyond that, it should allow students to work on some art historian skills that would typically be taught in a college level introductory course. Also, these changes will make it easier for students to focus on understanding the global scope of art, and trace themes of art throughout history. This new curriculum is also supposed to give teachers some more freedom to cater to their students’ individual needs, which will ultimately help them succeed in the course. Lastly, there will be a much clearer connection between the learning objectives and the skills that you will be learning. How: Okay, so all of that information is great, but how does that affect a student like you? For one, you will be required to know fewer specific pieces of art. The current system covers over 500 works of art, while the new curriculum will only focus on about 250. Since there are fewer things to learn, you will be able to go deeper with each one. Also, instead of necessarily trying to be an expert on each piece of art, you will be taught to use analytical skills and contextualization to get a better understanding of each piece of art. To reflect the changes to the course, the exam will also look much different. In the past, teachers have been unsure of what to expect on the exam and therefore unsure of what to focus on. It is impossible to be absolutely comfortable with 500 pieces of art. The questions on the new exam will test your general knowledge of themes, traditions, and art skills, which gives you some leniency with specific works. You will still be required to be familiar with a lot of artworks, but there are at least less to focus on. The actual format of the test has also changed. Instead of 115 multiple-choice questions, there will only be 80. And instead of doing two 30-minute essay questions and six 10-minute short answer questions, you will do two 30-minute essay questions and four 15-minute short answers. This will allow the test to focus more on your critical thinking and analysis skills than straight factual knowledge. 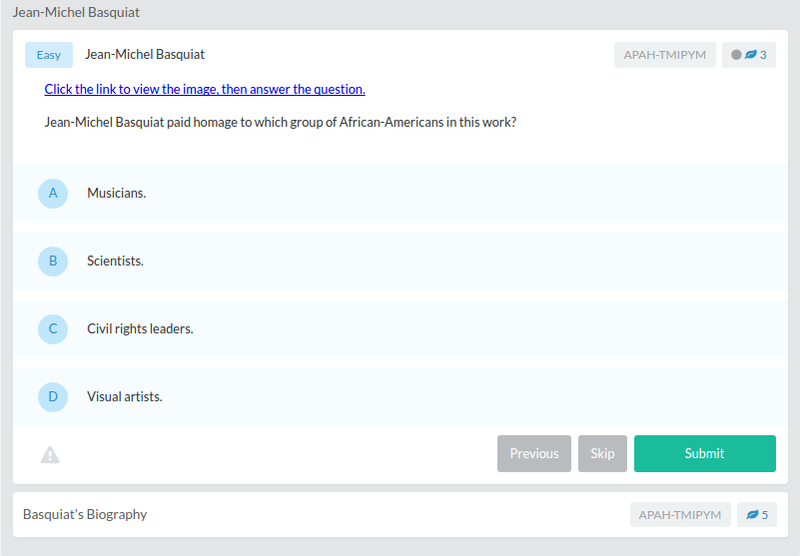 Overall, the AP Art History redesign was designed with you in mind, and is ultimately aimed at helping you succeed. It is sure to make the course a much more enjoyable and beneficial endeavor. Looking for more AP Art History practice? Check out our other articles on AP Art History. You can also find thousands of practice questions on Albert.io. Albert.io lets you customize your learning experience to target practice where you need the most help. We’ll give you challenging practice questions to help you achieve mastery of AP Art History. Are you a teacher or administrator interested in boosting AP Art History student outcomes?